Looking for something different I stumbled on "Grunts!" by Mary Gentle – it's subtitled "A Fantasy With Attitude". It certainly got attitude – the problem is that it doesn't have much else. The basic idea is to tell a fantasy story from the point of view of an Orc. As we all know the Orcs are the lowest of the low. The grunt, the first line of dispensable, your basic sword-fodder. If you are an Orc marching of to war, you can be fairly sure the nobody cares about you. You are basicly there to fill out the landscape and to provide practice for the good guys until they decide it's time to win the day. There seem to be an endless supply of Orcs and they all seem to be willing to die for the first Dark Lord who asks them to step out from a cliff. A book taking these strange creatures a bit more serious could be interesting. The primary character in Grunts is the orc Ashnak – Ashnak is not your average Orc, he actually seems to have a brain that somewhat works. And it start of interesting enough and then it takes a strange turn that could be even more interesting; Ashnak findes a dragons treasure containing strange weapons that should be familiar to anyone with just a bit of knowledge of modern weapons. Machine guns, pistols, large, small, cannons, a couple of military helicopters – and lots of everything. I'm guessing that somekind of marine manual was stashed behind one of the crates, because Ashnak, soon begins to train his band of Orcs into Marines. 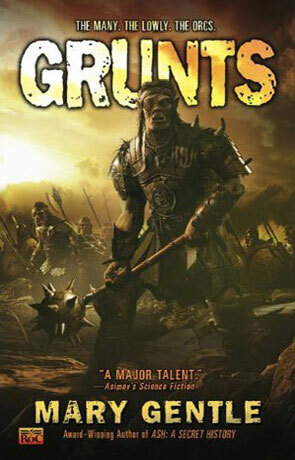 The Orc Marines are a huge success and the rest of the 450 pages of Grunts! are all about them and their dealings with the world, for a time they fight, then they train other marines, go in to politics and lots more. All that is good and well, but the story soon looses the few anchor points it started of with and goes of in one strange direction after another. None of them seems to be more than excuses to put the Orc Marines into situations that Gentle would like to write about. Which could be a lot of fun, but I tired of the marine thing really fast. It was like 450 pages of boot camp. Lots of shouting, shooting, more shouting and talk of weapons. At times I was afraid that I was going to be sick if I came on another dialogue where half the sentences consisted of “Sir, Yes! Sir!” or “Yo!”. There are some good ideas in this book, but there is also way to much shouting, a bit to much jumping from idea to idea and about a hundred and fifty pages to many in it. Written on 11th March 2003 by TC.